A new magnetic resonance imaging (MRI) contrast agent being tested by researchers at Case Western Reserve University not only pinpoints breast cancers at early stages but differentiates between aggressive and slow-growing types. The gadolinium-based agent is also more efficient and safer than traditional agents, requiring a gadolinium dose 20-times smaller, easily flushing from the body and leaving no accumulation in tissues, the researchers found in tests with mouse models. At the low dosage, the agent lights up cancer biomarkers during scans, overcoming the low sensitivity of MRI’s for imaging the markers. The research was published today (Sept. 25) in Nature Communications. To make the agent, Lu and colleagues at Case Western Reserve combined commercially available tri-gadolinium nitride metallofullerene (Gd3N@C80), a highly efficient contrast agent, with a peptide labeled ZD2, which was developed in Lu’s lab. “But the key technology for our targeted contrast agent is the peptide attached,” Lu said. The lab applies ZD2 to the surface of the soccer ball. The peptide specifically targets the cancer protein extradomain-B fibronectin (EDB-FN). EDB-FN, which is associated with tumor invasion, metastasis and drug resistance, is highly expressed in the matrix around cancerous cells in many aggressive forms of human cancers. In testing on six mouse models, MRI’s detected breast cancers in all cases. 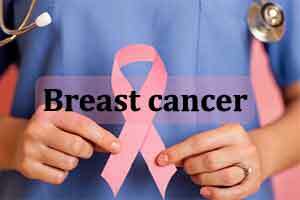 But the signal created by the accumulation of contrast molecules on three aggressive triple-negative breast cancers (MDA-MB-231, Hs578T and BT549) were significantly brighter. Because slow-moving ER-positive breast cancers (MCF-7, ZR-75-1 and T47D) produce less EDB-FN, fewer molecules attached. While detectible, the signal was muted. Co-authors of the study are biomedical engineering PhD students Zheng Han and Xiaohui Wu, research assistant Sarah Roelle and undergraduate student Chuheng Chen; and William Schiemann, the Goodman-Blum Professor of Cancer Research at the Case Comprehensive Cancer Center. Lu’s lab is now investigating ways to reduce the cost of producing the agent to make it more attractive for clinical use.